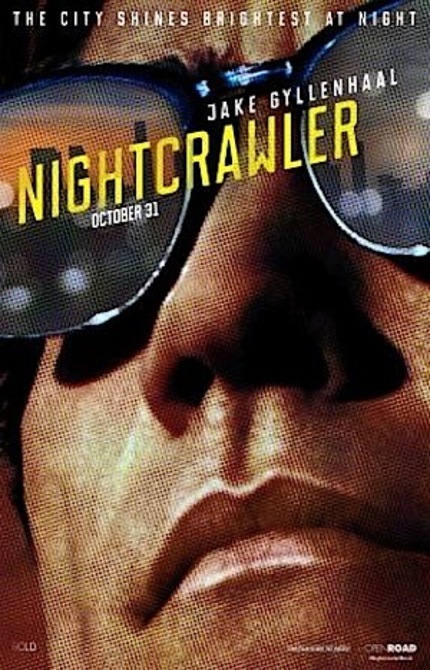 Much loved in these parts, a new red band trailer has arrived for Jake Gyllenhaal star vehicle Nightcrawler. Due for release October 31st, here's how the Toronto International Film Festival pitched the directorial debut from writer Dan Gilroy. When dusk falls on Los Angeles, the nightcrawlers come out. Roaming the streets, cameras at the ready, they outrace ambulances to get to the scene of an accident or crime first, looking to bag footage they can sell to local television stations. In this gripping portrait of LA's dark side from first-time director Dan Gilroy, local TV feeds on local crisis. Lou Bloom (Jake Gyllenhaal) is a loner and petty thief adrift in the LA night when he happens upon the nightcrawlers in action. He gets himself a cheap video camera and a police radio scanner and begins the chase. Fresh car accidents, robbery victims, home invasions -- everything is fair game. But the competition is stiff: Joe Loder (Bill Paxton) is already a seasoned professional with police contacts and a reliable buyer in TV producer Nina (Rene Russo). But Lou has a nose for blood. Seemingly immune to the moral dilemmas of his new job, he doggedly pursues the most shocking scenes he can find. It turns out he also has the eye of an artist: if the scene doesn't quite tell the story Nina needs -- urban crime threatening innocent suburbanites -- he is more than willing to enhance the picture. Like the protagonists of Michael Powell's Peeping Tom or Krzysztof Kieslowski's Camera Buff, he is a chilling metaphor for filmmakers. Gyllenhaal reveals this compromised character from behind eyes that can go suddenly, frighteningly blank, in behaviour that feels both surprising and true. Screenwriter turned director Gilroy (Freejack, The Bourne Legacy) crafts a tense atmosphere in this contemporary film noir, and gives Gyllenhaal the opportunity to deliver what may be his most forceful, compelling performance yet.